Washington DC (TADIAS) – The four crew members killed on board the Ethiopian military plane that crashed on Friday at Mogadishu airport in Somalia were all experienced Ethiopian Air Force personnel, including two senior pilots who had also served under the previous regime, a source told Tadias Magazine. A colleague of the former pilots who refused to be named said that those who died in the crash were experienced airmen who began work during the Derg era and were employed by the air force under the current government. 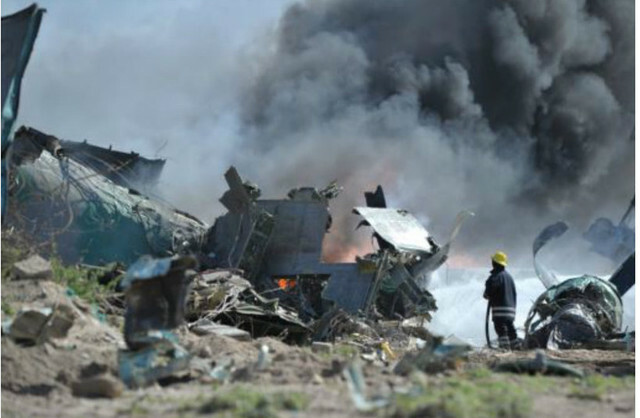 The other two crew members killed out of the six officers inside the doomed cargo plane are also reported to have many years of experience in the Ethiopian Air Force. The Ethiopian government has not issued a statement regarding the crash. But in a press release AMISOM said that the two surviving crew members have been admitted to a hospital in Mogadishu. News reports say the aircraft (Soviet-made Antonov 24) may have been carrying ammunition. According to international media, the Somali government is to appoint a committee later today to investigate the cause of the accident as well as the extent of the damage. Although Ethiopia does have a sizable troop presence in Somalia fighting al-Shabab militants, its forces are not in the country under the AU mission, AMISOM.